This gallery takes you through time from the early 1800s to approximately 1925, starting with some of the key jobs and activities happening in Nova Scotia before industry started, but which helped us adapt to it when it arrived. Here you can caulk a vessel or hoist a labourer’s block and tackle. Pump up a water supply to see how, when released, it can turn a water wheel or a turbine to power machines in a variety of mills and factories. Coal mining, so essential to the development of Nova Scotia, began as an industry here with the arrival of a British mining company in the 1820s. Our exhibits explain how their engines, equipment, and miners brought us the Industrial Revolution. In this area you will find Samson, a locomotive of that time and the star of the Museum of Industry. 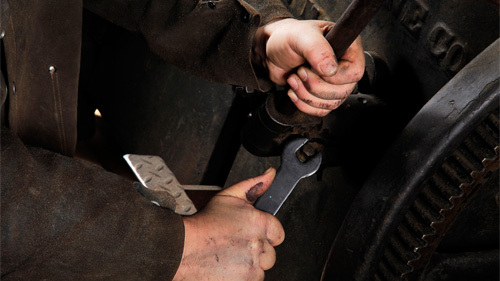 You also can experience the power of steam engines through demonstrations and our belt-driven machine shop, which shows how one steam engine could power many machines to increase productivity. 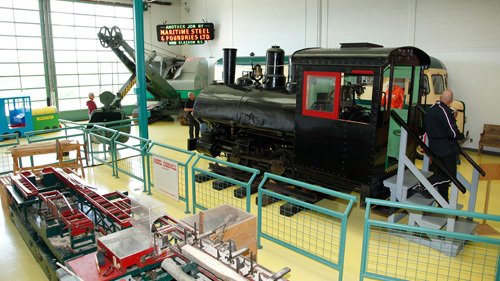 Moving on, you arrive at the heyday of industrial activity with exhibits on the iron and steel industries, the railway (check out our HO-scale model railway), automobile production, inventions, and factory work. Don’t miss our assembly line game where you have work to do. Before you leave this area, visit the “kitchen” to hear about living conditions and how housewives coped in some of Nova Scotia’s hard-scrabble industrial towns. 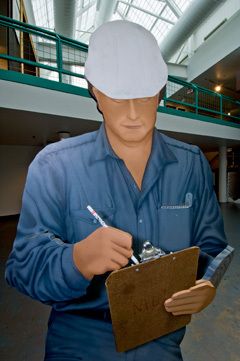 Throughout the exhibits the cut-out figures of workers show you how Nova Scotians worked in those days. You leave this gallery by descending a ramp into an open space where some of our biggest artifacts are on display. At the bottom of the ramp is a change of pace. Here you can find some of our largest artifacts. Climb aboard the “Shopmobile” bus, our mobile industrial arts classroom, where many rural Nova Scotia boys developed their shop skills from the 1940s to the 1960s. The bus itself is also “made in Nova Scotia”. A popular favourite is Number 5 locomotive, where you can stand in the cab and ring the bell. Be sure not to miss the sawmill demonstration, during which an interpreter will put a log through the saws like it would happen in a mill to transform it into lumber.